1. 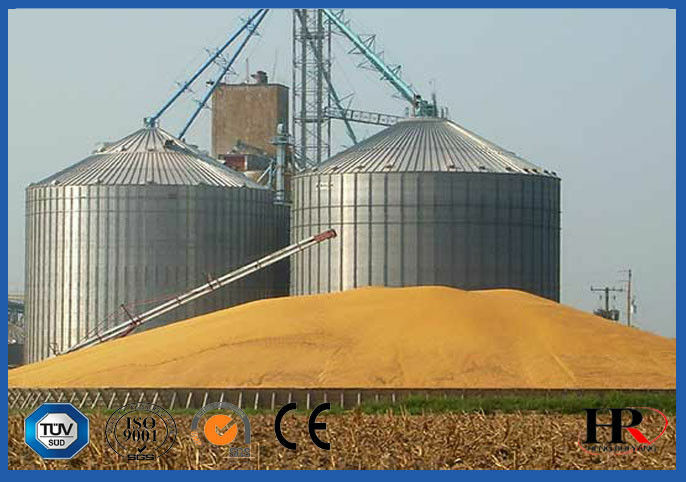 Vertical Grain Silo is popular with its simple structure,large capacity,various ways of unloading. Easy for maintenance and repair. 2. 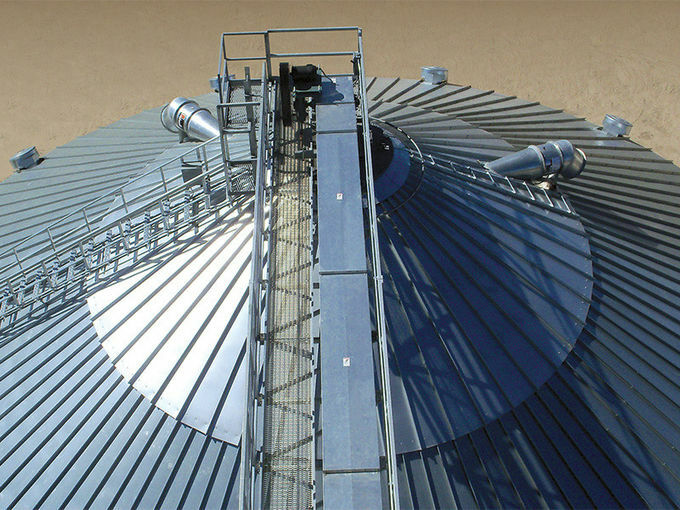 Wide Range of Hongyun silo Products include different models of flat bottom Grain Storage Silo, diameters of which varies from 6.417 m. to 32 m. and capacity up to 22.648 m³. 3. 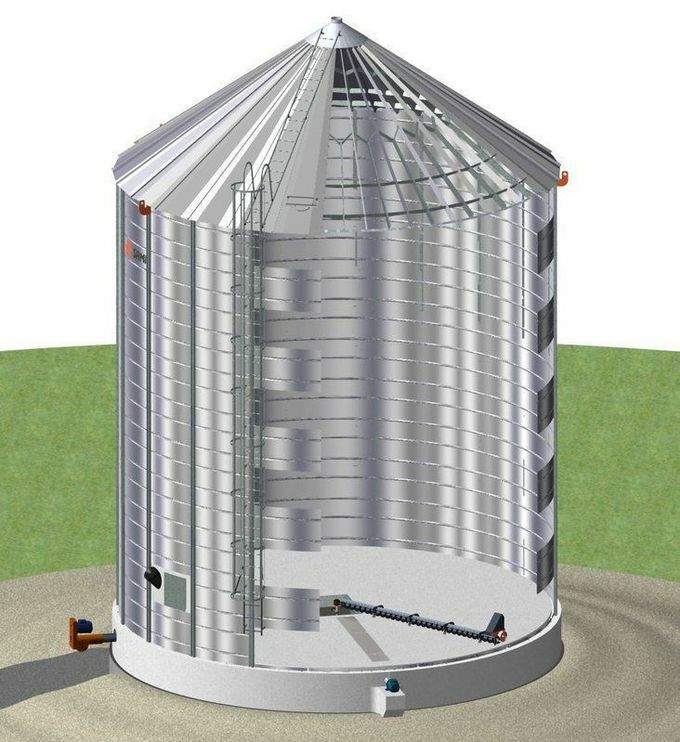 This kind of Grain Storage Silo are with larger capacity,which are easily installed and cost less. 4. There are many ways of unloading,such as the fluidized unloading,multi-spot unloading,sweep auger and manual cleaning etc. 5. The concrete conical bottom is also available for discharging.Flat bottom Grain Storage Silo are widely used in grain mills,some of them can be used in oil,feed,flour,starch,brewage and port or grain storage industrial lines. Design view Can be built by hopper concrete or flat cement based on your requirement and actual demand. Silo Discharge There will be one or more discharge holes on the bottom based on different materials and capacity. The roof is design to stand up even the harshest environment of extreme snow disaster with echo of top and down part strong structure and connecting radial ribs which is Z interconnected again itself. Roof panels incorporate with ribs with over and under lap profiles ensuring a precise fit. People can through the manwhole check the materials situation, very convenience. A commercial 275g/m2 double galvanized steel coating increases life and durability. 450g/m2 and 600g/m2 coating available for customized order. Each sidewall sheets are manufactured from high-tensile steel that has the ability to overcome extreme power, pressure. 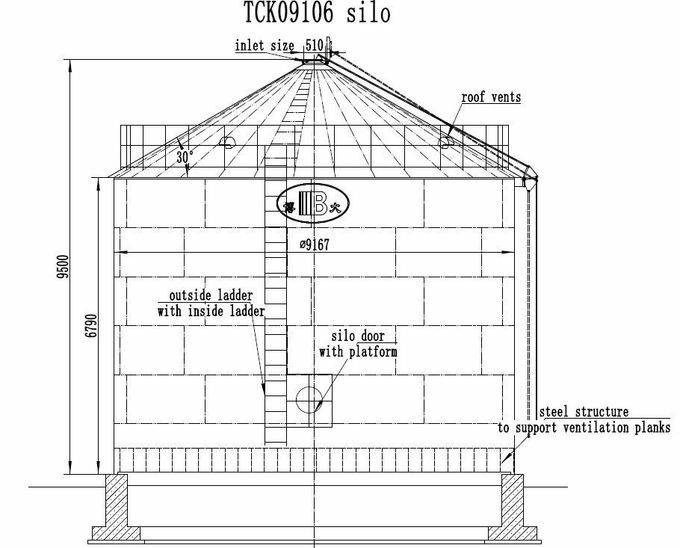 Adopting high tension stiffener(can be located inside or outside silo) profiles make bins stronger allowing silos to stand well even under extreme hurricane. Base stiffener boots are coated so they won’t rust over time. For tall silos or that need to resist heavy wind. Wind ring and brackets reduce bolt holes in stiffeners; swaged technology ensure silo power load capacity. Wide flange I-Beam support structure has the strength and durability to support the heavy hopper silo loads long time, and with consideration of wind,snow, seismic requirements.